The fact that a lot of us have studied (I guess all of those who are reading this), makes me ask a question to my fellow readers. Did you ever apply something you learnt in school, (ofcourse, apart from academics) after leaving school? If you did, how was the experience of revisiting old memories of steps you followed in doing that thing? How did it turn out to be? Was it something you could be proud of or did it turn out to be a disaster? I would like to really see the responses! A lot of us did have some kind of art and extra curricular classes where we were taught things that a lot of us (boys) had stereotyped to be girly stuff. Well, yes, I've known that happening. I too had to take a few of these classes (these activities, in my time of schooling were considered unimportant), and thus, a lot of schools, and parents did not pay too much importance to these activities. We used to have classes for Art, Music/Dance, SUPW, apart from a couple of other extra curricular activities like Games, Library and Computer. For us, these classes used to serve as a break from regular studying throughout the day. This was when we could enjoy the time, doing something other than studying. Though, for a lot of us, the entire schooling life went through without knowing the actual full form of SUPW (which, as what Google says, is Socially Useful Productive Work), I doubt if it is always socially useful and productive. :P A lot of us, boys never took a real interest in the class, as we considered this girly stuff. Cooking, stitching, painting. I, however had a slight interest in arts, and an inclination towards how things were done. So, I sort of liked these classes. We were taught recipes, painting (including different art techniques), embroidery, and soft toy making too. And I took interest in these things. Around a year back, I decided to reproduce an artwork technique I had learnt in one of these classes while in school. It was TOOTHBRUSH PAINTING. A pretty easy technique for those who couldn't make masterpieces, or even proper pieces with the regular paint brush. Just a single class, and years later, I decided to do something with what I had learnt. The reason - we had got our home painted. I decided to do something on the walls, which otherwise were looking dull with single colour. I am not so rich that I could afford the decorative wall painting and colours, so got it painted regular. We looked out for options for decorative patterned rollers which are used to create patterns with different colours on the plain walls. We didn't like any of them. 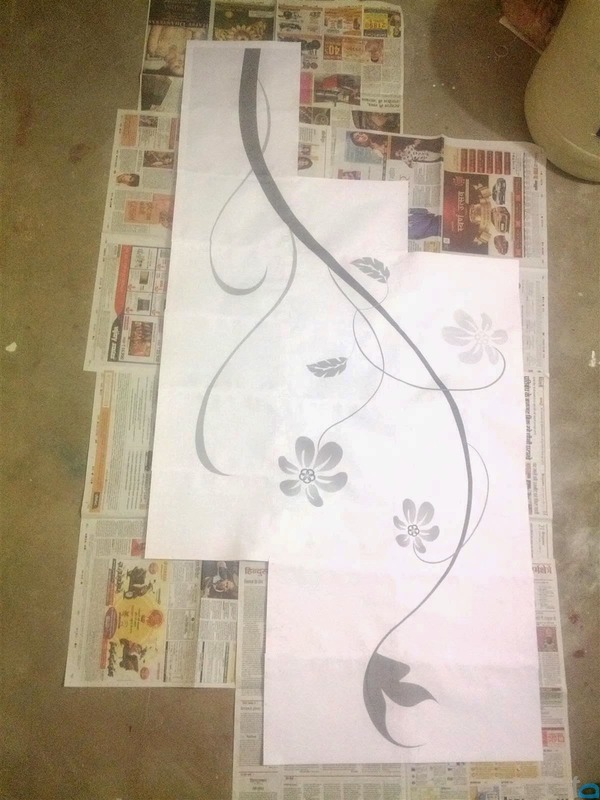 The idea clicked, why can't I do the simple stuff of painting using stencils. Just that I didn't have a stencil to paint with. I had to choose a design, make out a stencil, and then paint on the wall. The big question was - Was it easy? Initially, it appeared to be a big YES. As I jumped in, I realized that it was not as easy as it appeared from outside. I had to do it on a 10 feet high wall. Probably, that meant I had to make an piece of art that spread over a good enough part of the walls. Anything bigger than 5 feet in height and 2-3 feet in width. The task seemed easy. I scoured the internet for days for designs and patterns. Nothing appealed to me. 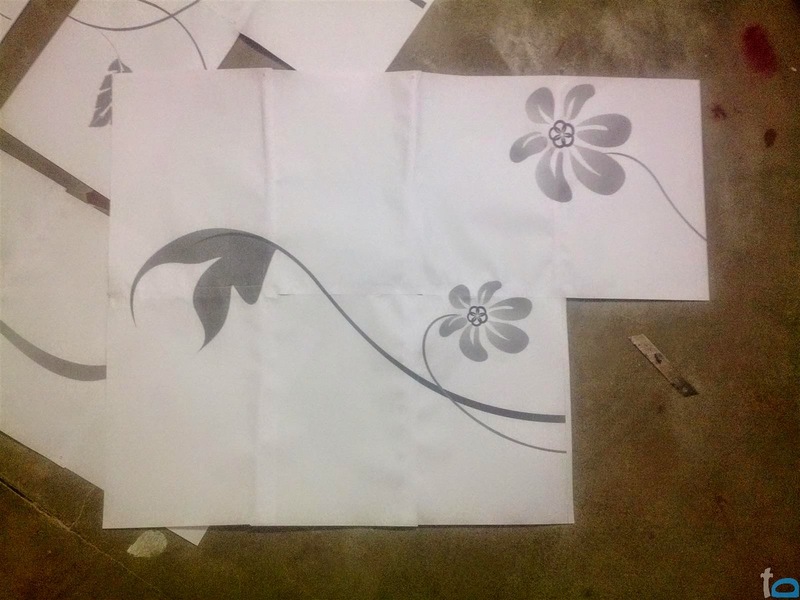 What I was looking for was something that looked beautiful, and at the same time didn't need too much intricate work, as for making that stencil, I would be in a fix in doing that much intricate work. I settled down with one design. Initially it was a try out, since this wasn't something I had done earlier, so, everything was for the first time. The design I selected was a vector graphics file in the format supported by Adobe Illustrator, or other vector graphics editing applications like Inkscape. 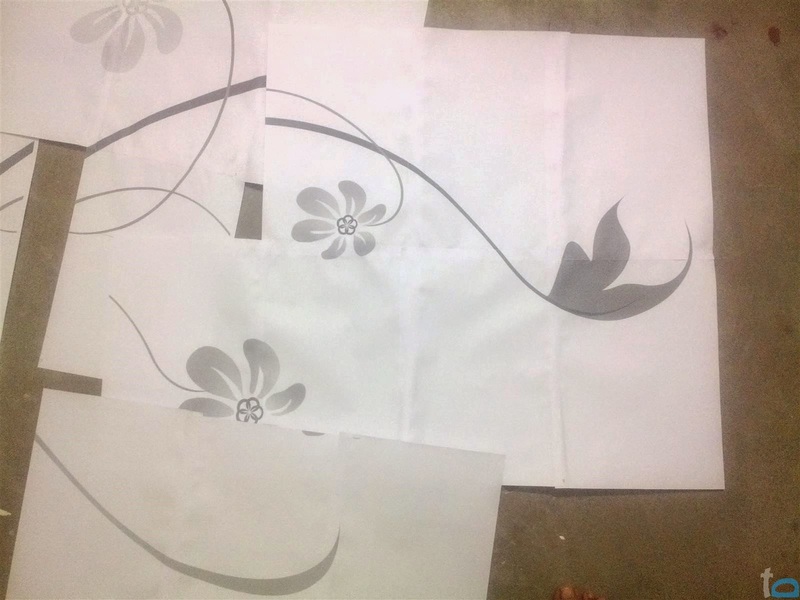 A vector graphics file was required because I had to enlarge the image from a sub A4 size image to a 7 feet by 3 feet wall art stencil. THIS IS WHERE ART MEETS TECHNOLOGY! 1. 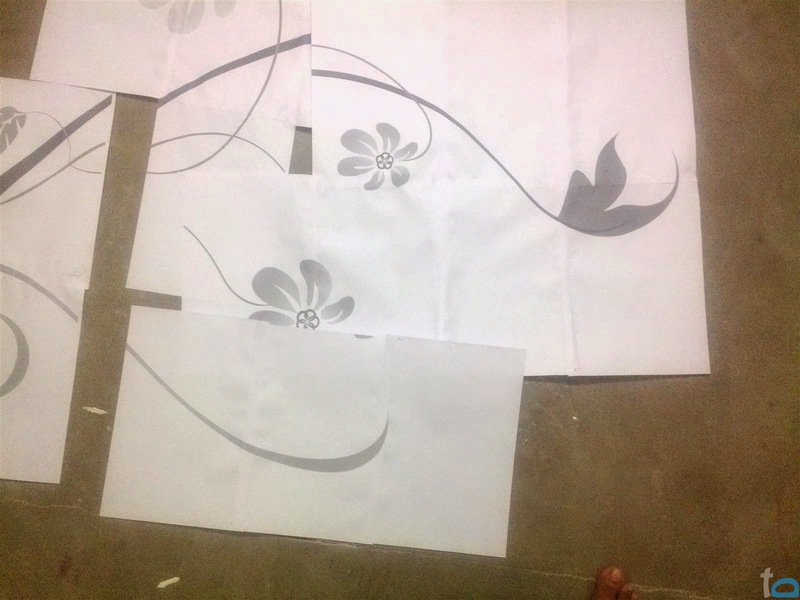 The first step includes finding a good vector graphics image which you could enlarge to create your wall art. There are a lot of sites that provide free vector graphics. Choose one that doesn't have too much details, and finer areas, otherwise, cutting out these parts by hand will be a headache. 2. 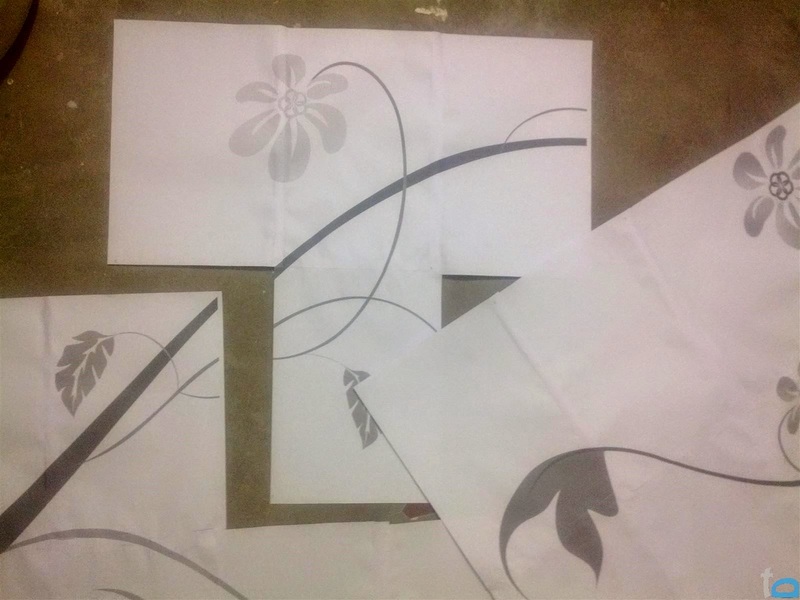 A suitable vector graphics editing application like Adobe Illustrator or Inkscape to edit and enlarge the small image to be printed over in the required dimensions. 3. A black & white printer to print out the sheets. A4 sheets. If you have a printer that supports larger paper size, you can use that. 4. Paper cutter or blade to cut out the areas to be painted on the wall. 5. Glue, transparent tape to join the sheets together. 6. Water colours, toothbrushes to paint. I used some oil based colours that is used in wall paint, and some white wall paint which was lying around, to create the colours. While mixing the colours, ensure that you make enough amount of colour, so as to avoid the need to mix colours again. If that is needed, there are chances that there maybe possible colour differences, which will be visible on the finished art. 7. When actually working on the wall art, make sure that you have the parts of the wall you don't want to paint, properly covered with newspaper. 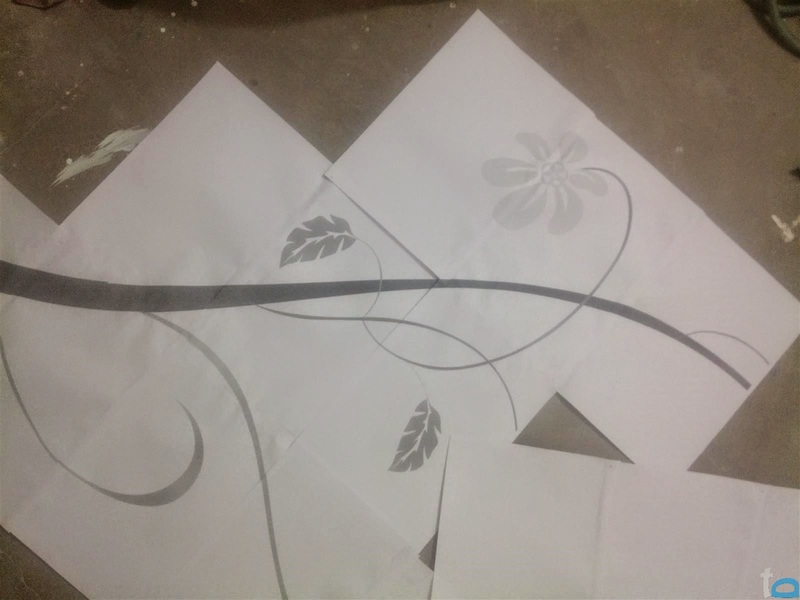 Also, while working on the edges of your stencil, keep the exposed areas of the wall covered with some newspaper and tape, to keep it safe from unwanted colour droplets. Now the question you might have is how does TOOTHBRUSH PAINTING work? Well, the answer is pretty straightforward. All we are supposed to do is use a toothbrush, a cheap one will do a good enough work, it doesn't need all the technological mumbo jumbo related to toothbrushes and dental care, including criss-crossed bristles, extra soft bristles and stuff like that to create stunning art works with toothbrushes. Usually, this is done with water based colours, but you can choose oil based colours as well, just ensure that it's liquid enough to form small droplets. Using the brush dipped in colour, art work can be created on whatever medium one wants. You can do that directly on open surfaces, with free hand, or make use of a stencil made out of paper (like I've done here) or a readymade one, if available. When you move your fingers or thumb on the bristles of the brush dipped in colour, the bristles throw away small droplets of colour. This is much like inkjet printing. If you have an idea of inkjet printing, you can very well understand how toothbrush painting works. And this is how I did it. First, let me warn you. 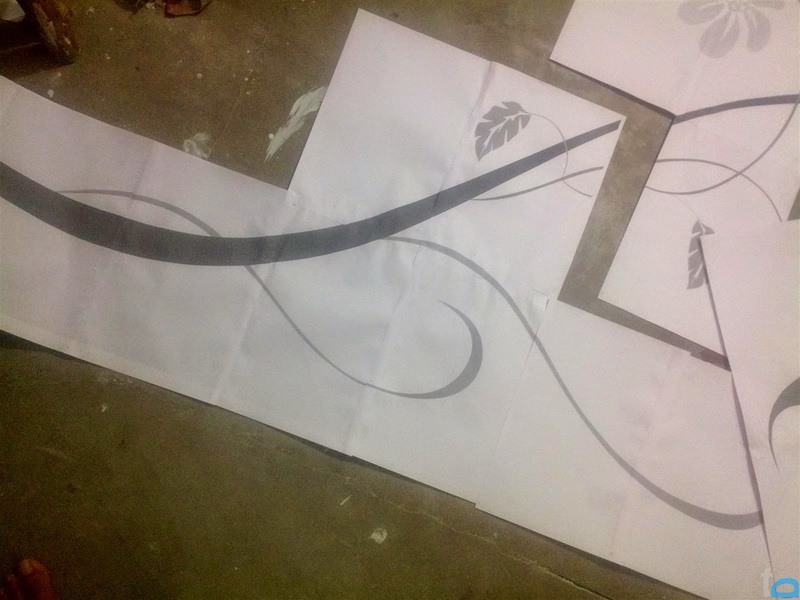 I printed a huge vector graphic image on multiple sheets of paper. All of the sheets in total turned out to be 27 A4 sheets. You will need to work on as many sheets as you decide the final size of art to be. The larger the size, the more the sheets you will need to cut and paste, and work upon. Don't want to read anymore? No issues, I've got some shots (though these are bad ones, as I've clicked these indoors with a cellphone, and well, we all know how good cellphones act as a camera indoors, in not-so-good light. But, I hope, you get a good enough idea of what's happening. Take a dive. 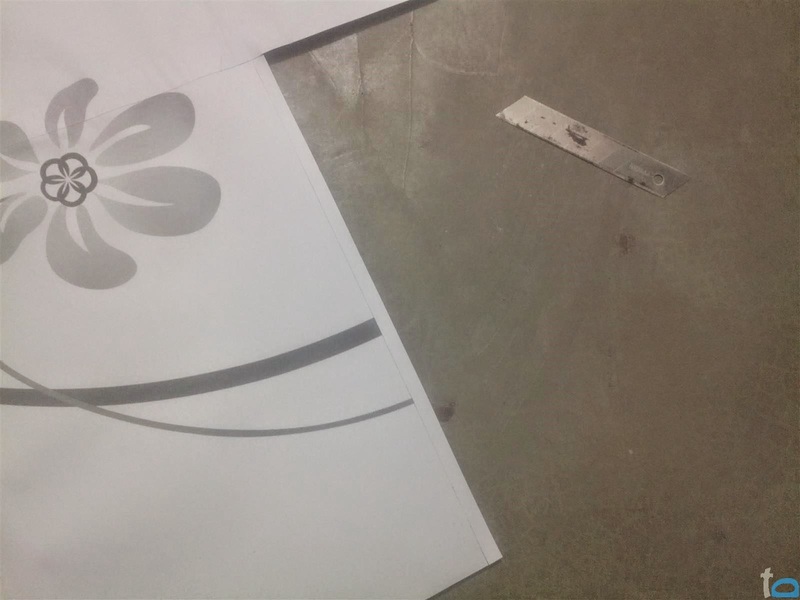 Printed sheets of paper and a blade from a paper cutter. Printed sheets of paper, arranged and pasted together. A section of printed sheets of paper pasted together. 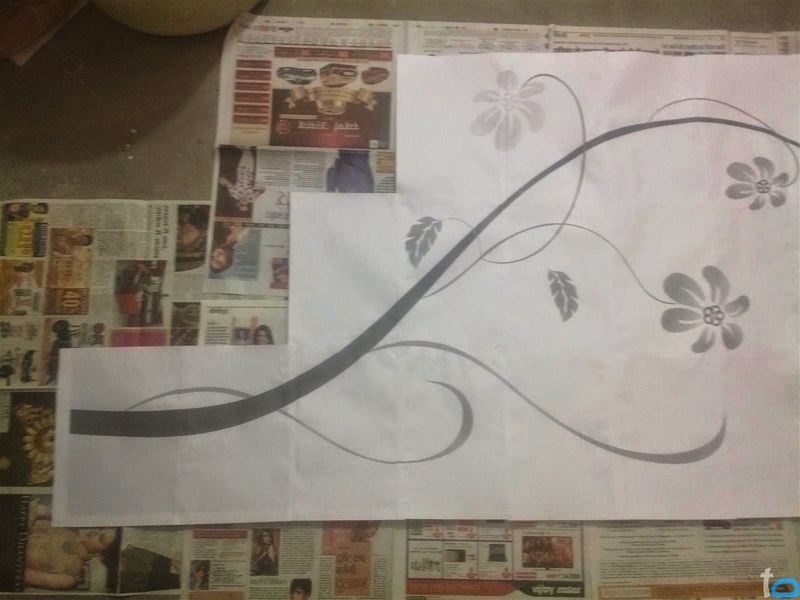 The final piece to be cut out and used as a stencil. 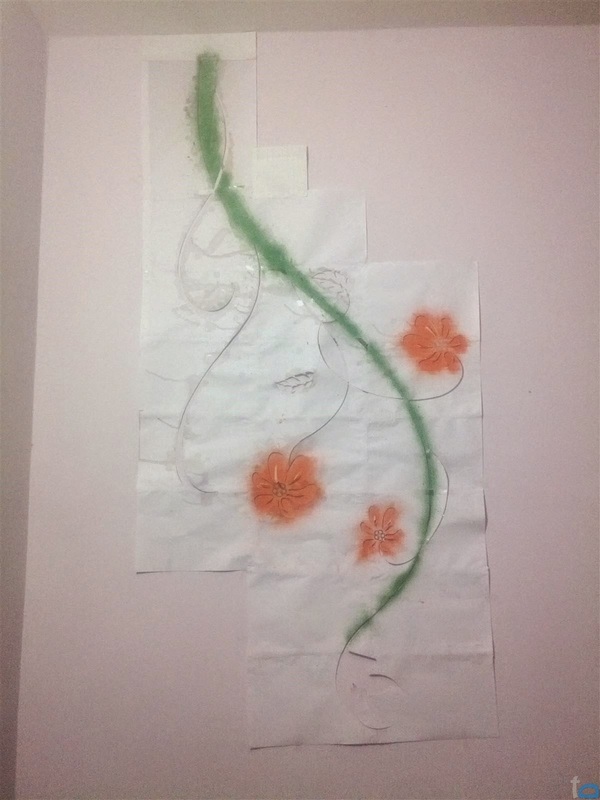 Still incomplete art work, on the wall. What it turned out to be? Well, that's pretty good question. Since it was the first time I tried doing something of this sort, I was pretty much not impressed with this, with the later one in front of me (yes, I made a second one too, and have planned on a third one as well. ), the finishing touch not that perfect as it could have been, and more or less, it's still unfinished (but yes, it's not something like the last photo, I've finished painting the thing, more or less, just the thing left is finishing touches, and giving a bit of attention to finer details to make the vines and leaves look uniformly shaped), as I had some other unplanned things to take care of. The final result? No, not yet. Enjoy the pieces I have shared with you for a while, and I will do a post maybe, next week to show you what this turned out to be, after I completed a bit more of painting and finally removed that huge piece of paper hanging on a considerable chunk of my bedroom. I would really like to see if someone was impressed enough to try this one out at their homes or offices. Would love to see the results! Did I tell you that I am a foodie too? Well, I am one. Not a really big one to walk, sleep, and think food, but, still, I am one, because, I am always on the lookout for new food items, and their recipes. Whenever I am out to eat something (by the way, I don't go out too often), and if I like something, I try making it at home. While the list of things I can cook is not that extensive, but I can say that I can atleast cook better than a lot of men. And it's quite often when I am in the kitchen cooking something or the other. Be it cooking it from the scratch or making something out of already cooke stuff, in case I want to eat something other than what's been cooked by my mother. Infact this is how it all started. Whenever I wanted something other than what was cooked, I was encouraged (supposed) to help myself. Slowly, I started cooking easy things, sort of re-cooking things, then I started experimenting with new recipes, whenever I came through something interesting. One of my favourites in the Indian cuisine is the tandoori stuff. I absolutely crave for things cooked in tandoors, be it naans, tandoori rotis, tikkas or anything else as long as it is vegetarian. South Indian stuff too are among my favourites. Though I hated the idea of having only south Indian food during one of my visits to Hyderabad-Secunderabad, in Andhra Pradesh, some years back. It was then I realised how much I love the North Indian food that I can't live without it. For a change it's fine to have food from other regions but not on a daily basis. Since I like experimenting with food, I will use this place to share my experiments with the ther foodies. But if as a foodie you are looking for just food, I'd like to apologize. I guess you didn't read the blog's name properly. And yes, since I like clicking photographs too, do expect some photographs of the foodstuff I make. I won't really be putting down recipes everytime like the ones you can find on cooking blogs, but, you can expect it sometimes. See ya with the food platter! The Internet, these days has reached quite far, and with the increased everyday usage of the internet and ever increasing use of E-commerce, and security threats in the form of hacking, hostile takeovers of computing devices by hackers and keylogging, targeting certain security vulnerabilities in software, or by installing applications that record all the key presses on your physical keyboard, it is very important that the one who uses the internet for their purchases, or bill payments, be aware of the vulnerabilities they can ever face. While online shopping has, over years become much secure, with the use of secured transactions, various steps taken by entities like the online shopping portals, payment gateways, a lot of these vulnerabilities can easily be mitigated. However, when it comes to purchasing and getting duped in your purchase, as this can happen almost anywhere, whether you buy online or go for the brick and mortar store. A number of businesses do deal with counterfeit products, and this business is only growing. A number of people can not differentiate between genuine and counterfeit products, and thus get cheated. While shopping online, at times, as has happened with me as well, we buy something else, and end up getting something else delivered, even if it wasn't a different product, maybe, the colour you placed the order for was not shipped, but some different colour was. I have been shopping online for around 6 years now, and I can say that almost half of my shopping gets done online. I have an account with most of the popular shopping portals, and having bought products from most of them, I can say that I somewhat understand the how's and what's of most of them. When I came forward with a certain incident where someone had got a faulty product, I posted down this guide to safe online shopping, on a blogging forum - IndiBlogger. While I have excluded other things, that would make your online shopping safest, for now, (maybe, I can do that some time else, as that happens to be a part of our computer etiquette), for this one, I will try concentrating what a regular shopper could do to not get duped while shopping online. Before I proceed with the guide, I think it will be good to explain the ways the online shopping portals work. Depending on how the shopping portal procures the products, how and who sells it to you, what options you as customer have in case you receive a faulty product, whether the site is engaged in Business to Consumer (B2C), Business to Business (B2B) or Consumer to Consumer (C2C) business model, you can expect great experience to worst experience. In case of some online shopping portals, a single business procures the products from distributors of different brands and products, sells it to the consumers and/or businesses. In other models, businesses sign up with an online store to sell their products, and in yet another model, individuals too sign up to sell products of different brands. The holy grail of online shopping is Attention to Details. One has to always carefully read through all the terms and conditions and the entire product listing for the product. Many a times, the buyer is partly at fault for buying a product that is counterfeit. Being someone who has been shopping online regularly for around 6 years now, all I can say that, it is you who is most responsible for any such incidents. Since most online shopping sites operating here in India like Flipkart, Amazon, Ebay, Snapdeal, Naaptol, Tradus, Indiatimes Shopping, Shopclues, etc. are Online Marketplaces, which serve as platform for a number of sellers (which can be anyone from an individual to a reputable brand) who sell a variety of products at different prices and with different terms and conditions. a)Manufacturer Warranty - The most common type of warranty condition, wherein the manufacturer of the product provides you with the after sales support, and warranty services. In this case, the product you are purchasing needs to be bought from an authorised dealer of the brand (which becomes quite hard to confirm), but in the interest of the brand, this becomes important for quality control and tackling counterfeit products. b) Seller Warranty - This can be found on eBay and other market places quite often. This means that irrespective of the brand, the product belongs to, the seller who has sold it to you will be responsible for any after sales support, repairs and product warranty claims. This essentially means that you can't approach the manufacturer of the product for after sales service, as the product might be a counterfeit one, or, in some cases, illegally imported product. c) No Warranty - This means there is no warranty of any kind. Many a times, we fall in trap of a cheap product overseeing the clause "Seller Warranty" or "No Warranty" and other such things. I understand that at many times, the deal is so great that there is a difference of ranging from 25-50% in the cost of a product with manufacturer warranty and one with seller warranty or no warranty, that you are tempted to take a risk. So, you should beware before proceeding, considering the fact that the seller may or may not honour the promise, or claiming one may be a headache. 2. Bill/Invoice: A lot of the sellers on marketplaces like eBay, Snapdeal, etc are common small shop owners and individuals who buy products at lower (wholesale) prices and sell you. In most such cases the seller won't probably give you a bill, because he/she himself was a buyer. Like I, for example, may approach some computer dealer in Nehru Place, buy products for cheap and sell them at a premium at such market places. I won't be able to give you a VAT paid Invoice because I do not have a VAT or CST number. A number of sellers provide you with a proper VAT paid bill and most of the times, such cases are properly listed on the product listing pages. This is because such a listing increases the reliability of the product, thus increasing the chances of sales too. YOU SHOULD ALWAYS check out whether the seller is providing a bill or not. If information on this hasn't been provided there, you can try contacting the seller, if the marketplace provides you a way to do that and ask before purchasing it. MOREOVER, BE PREPARED TO SUFFER as the manufacturer is not liable to provide you with warranty services without a proper bill, and you don't have rights to engage a legal battle without a proper bill, if dispute arises. 3. Item Condition: The item condition is another important thing. A lot of marketplaces do sell both new, used and refurbished goods. Make sure that you check this out, before placing the order for the product. Like in case of eBay, a seller has to include the item condition, irrespective of whether it is New, Used or Refurbished, in the item listing. Failing to do so, the seller maybe penalized by the marketplace. The item conditions, as the names suggest are - New, meaning, a brand new, unused product, most probably in the original packing, with all the accessories. With a proper bill, you can be sure of getting warranty services and after sales support in case something goes wrong with the product when you buy a new product. Used - meaning the product has been used before by someone. There's no guarantee that the product will work flawlessly, and you might end up paying a lot more than you would have paid for a new product, just to salvage the money you put in getting a used product. You can not approach the manufacturer for warranty services. After sales support from the manufacturer will come at a cost. Refurbished - In a lot of cases, some people/entities engage in selling used products (restored in a working condition), at a lower cost. At times, the item comes with some kind of warranty (usually lower than that on the brand new item itself). 4. Seller Ratings: Most online marketplaces now have in place, a method to show the seller's reputation, based on a variety of factors including Product price, shipping time, ease of communication, product quality, and consumer review and ratings and such. These seller ratings come in handy whenever you are there to buy some products on marketplaces like eBay or Snapdeal and even if it is Flipkart. Always go with reputed sellers. If required, check out the customer's reviews and ratings. On Ebay, for example, there is a very extensive system to check out seller reputation. Just keep into consideration that there are people who can't ever be satisfied, no matter what you do, so there may be some odd negative reviews and ratings too. Seller's ratings is one great tool with buyers, on online marketplaces, which can drastically harm the seller's ratings, business, at times, even making it impossible for the seller to carry on the business with the marketplace, if the ratings fall too low. Just the fear of negative review, for most sellers gets the work done. This would be more important for a reputed seller, than a rookie. In case of eBay, there are seller badges and coloured star indications against each seller and buyers, based upon the number of products sold/purchased by them, and one can actually check the buyer feedback for the seller. 5. Check the Price: Since online marketplaces are crowded, there are hundreds of sellers spanning over tens of such marketplaces who offer similar products at varied prices and conditions. Considering all the points I stated above, the comparision of the price of the product you are about to buy is the most important consideration, but you should keep it at the lowest point of list of considerations. There are dozens of price comparison sites that would make your task easy. Websites like Junglee.com, MySmartPrice.com are just a couple of examples. 6. Reputation of the Online Marketplace: This has to be considered because based on this will be your shopping experience. The reputation of the marketplace also is an outcome of a number of factors including the product prices, quality of products, shipping times, customer service and other such stuff. By this, I consider that Flipkart.com is the best online marketplace, followed by Amazon.in, Homeshop18.com, Ebay.in(com). My ranking of these marketplaces depends upon the factors I have pointed above. Whenever you are out there to buy expensive products, go with reputed online marketplaces/sites. I'll suggest Flipkart.com (WS Retail) to anyone, anyday, because, as per my experience they are the best, even if they are not the cheapest. 7. Read the Product Listing Carefully: You must make sure that you read all the product's listing, each and every point carefully before making a purchase decision. A lapse in your understanding of a product listing may result in you losing the entire money, because, the seller made it available on the products listing but, it was a lapse on your part in reading/understanding it. I have been shopping with ebay.in since 2007, when I bought logitech multimedia speakers, my first ever online purchase. The journey so far has been through lows and highs and I believe that most of the times, the sellers have got the disputes resolved themselves. Whenever I had to reach the customer care of eBay, it too has been a decent experience, considering their stringent customer protection programmes, that as per my experience, is the best among all the marketplaces in the Indian scene, except Flipkart.com, which tops the Customer Experience chart with their awesome customer service, no questions asked returns, 30 day return/replacement guarantee covering a lot of the sellerson the marketplace. In another forum, I read that people have faced problems with Flipkart too, and the plight of one such person was featured as an article on the website of a leading technology magazine, prompting one of the founding members and partners of Flipkart.com to respond to it. Just a tip: Whenever you shop online at a marketplace, make sure that you take a backup of the product's listing page. This is because, in case of a dispute, there's a small probability that the seller may change some specific terms or conditions or listing details like product colour, etc. Having a backup of the entire listing makes sure that you have a valid evidence to prove your point. You can do this by saving the page as a pdf file, easily possible on Google Chrome. When Dealing with Seller/Customer Care: Always try and make sure that you keep all interactions/communication on email (written evidence). It may take more time than phone support, to resolve your case, but it's the best method, as far as I know, if, you are forced to proceed further, and take a legal recourse. In case you get products different from what you ordered: Like you asked for a red T-Shirt and were delivered an orange one, or you asked for a wall clock in blue and silver colour tone but were delivered in a black and silver colour tone, always make sure that you get back to the customer care, in case you did not like the colour/design, and get it replaced. We should always get what we paid for. In this case, beware of statements like "Item colour/design will be delivered as per availability", as in case of a lot of marketplace shopping portals. If you agree with that statement, and are ready to receive the flag of some other country when you asked for Indian flag, because it is a flag, and the seller shipped you the colour/design that was available with him. Keep these points into your mind, whenever you are out there shopping, more importantly, when it has to be done with online marketplaces. Do share your tips, if you feel those can add value to this guide, and help us all shop better!